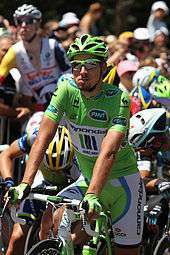 Peter Sagan (born 26 January 1990) is a Slovak professional road bicycle racer for World Tour team Tinkoff. Sagan had a successful junior cyclo-cross and mountain bike racing career, winning the Junior Mountain Bike World Championship in 2008, before moving to road racing. Sagan is considered one of cycling's greatest talents, having earned many prestigious victories., including two World Championships, two Paris–Nice stages, three Tirreno–Adriatico stages, one in the Tour de Romandie, two and the overall classification in the Tour de Pologne, a record fifteen stages and the overall in the Tour of California, and another record thirteen in the Tour de Suisse. He has won a number of Classics, including the Monument race Tour of Flanders, two Gent–Wevelgem races and E3 Harelbeke, together with eleven stages in Grand Tours: four in the Vuelta a España and seven in the Tour de France. He was also the winner of the points classification in the Tour de France, in 2012, 2013, 2014, 2015 and 2016; as a result, Sagan became the first rider to win the classification in all of his first five attempts. Born in Žilina, Sagan is the youngest child among three brothers and a sister. He was brought up by his sister as his parents spent most of the day taking care of a small grocery shop they own in his hometown. His older brother Juraj Sagan is also a professional cyclist, and is also a member of the Tinkoff team. Sagan started to ride bikes at the age of nine when he joined Cyklistický spolok Žilina, a small local club in his home town. Throughout his junior years Sagan rode both mountain bikes and road bikes, and was well known for his unconventional style of riding in tennis shoes and T-shirts and drinking just pure water. Sagan drew a significant amount of attention when he appeared at the Slovak Cup with a bicycle borrowed from his sister. Sagan had mistakenly sold his own and had not received a spare from the Velosprint sponsor in time. He won the race despite riding a supermarket bike with poor brakes and limited gearing. Sagan's first professional cycling opportunity came along when he was hired by the Dukla Trenčín-Merida team, a Slovak outfit in the Continental (third) division. In 2008, he won the Mountain Bike Junior World Championship in Val di Sole. That same year he also finished second in the Cyclocross Junior World Championships in Treviso and the Junior Paris–Roubaix. Sagan joined a Pro Tour team Quick-Step for road testing but failed to secure a contract. His frustration was so deep that he decided to quit road cycling, however pressed by his family he gave it a try with Liquigas–Doimo and succeeded. 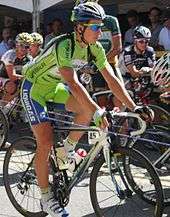 Liquigas' Zanatta offered Sagan a two-year contract (2010–2011) with an option to ride mountain bikes for Cannondale. In April 2010 the contract was extended to 2012. Liquigas doctors and managers were stunned by results of Sagan's medical tests, saying that they had never seen a 19-year-old rider as physically strong and capable. During the training camp Sagan destroyed more mountain bikes than any other rider due to his ability to put a bike through its paces. This earned him the nickname "Terminator". I do not want to be the second Eddy Merckx. I want to be the first Peter Sagan. Liquigas selected Sagan for his first Pro Tour road race Tour Down Under in January 2010 at the age of 19. He was involved in a crash during the second stage but kept riding with 17 stitches in his arm and left thigh. In the queen stage to Willunga he joined an attack over the last climb with Cadel Evans, Alejandro Valverde and Luis León Sánchez. The four fought to hold off the sprinters' group over the next 20 kilometres, with Sánchez taking the win. Sagan won his first and second Pro Tour stages during the 2010 Paris–Nice road race. Sagan was not initially nominated for the race, but joined the team after his teammate Maciej Bodnar broke his collarbone. His first stage win was gained on 10 March 2010, when Sagan joined a move initiated by Nicolas Roche on the final climb of the third stage into Aurillac and out-sprinted Roche and Joaquim Rodríguez for the stage win. This stage win also gave Sagan the lead in the points classification, giving him the green jersey. Sagan's second Pro Tour win came two days later from a solo attack in the fifth stage into Aix-en-Provence. Attacking three kilometres from the finish, on a steep climb, Sagan was able to hold off the Peloton to claim the win. Alongside his two-stage wins, Sagan also finished second in stage two at Limoges and third in stage six into Tourrettes-sur-Loup. The combination of high stage placings and intermediate sprint points won Sagan the Green Jersey for 2010. He finished the race 17th, three minutes and twenty one seconds behind race winner Alberto Contador, who praised the young Slovak and predicted he would be a rival to watch in future races. He also finished eighth in the "White Jersey" or Young Riders Classification. Sagan at the 2010 Tour of California, where he finished eighth overall as well as winning the points and young rider classifications. At the 2010 Tour of California, Sagan won the 5th and the 6th stage, coming in with the GC contenders each time. After missing the move up Bonny Doon on stage 3, he was 17 seconds back. The two stage wins that he took not only moved him into 3rd on GC but also put him into the points jersey. Going into the 7th Stage Time Trial through Los Angeles, he was only 9 seconds back. Even though he had prior success in Prologues, this Time Trial was slightly too long, and he lost 1 minute and 35 seconds on GC going into the final stage. Even though he was dropped out of the select GC group on the last lap of the 20.4 miles (32.8 km) circuit, he secured both the Youth Competition and the Points Jersey. He ended up 8th in the overall, behind seasoned veterans like Levi Leipheimer, Michael Rogers, David Zabriskie, Chris Horner, and Jens Voigt. Sagan finished fourth in the opening prologue of the 2010 Tour de Suisse, only three seconds behind Fabian Cancellara, but finished almost 11 minutes down in the second stage and didn't take the start the following day alleging severe fatigue. After taking a break during July, he returned to form later in the season, securing high placings in a number of European races as well as second place in the inaugural Grand Prix Cycliste de Montréal. He rode the World Championships in Geelong, Australia for Slovakia, but failed to make an impact in the long race. He planned to ride several late season races including Paris–Tours and the Giro di Lombardia but an intestinal issue forced him out of the former and weakened him in the latter. Sagan was set to continue in 2011 with the same team, now renamed Liquigas–Cannondale. At a team training camp in December 2010, Sagan said that his first goal for the 2011 season would be Milan–San Remo. After beginning his season with some solid placings in a couple of Italian one-day races, Sagan really got his season going at the Giro di Sardegna. He won three of the five stages in the race, and won both the overall and the points classification, narrowly hanging on to beat José Serpa by three seconds in the general classification. During the Tour of California, he won stage 5 on his way to a win in the points classification for the second straight year at this event. In June he took part in the Tour de Suisse starting off with a third place in the opening prologue. He then won a mountain stage 3, showing his versatility, when he caught Damiano Cunego on the descent of Grosse Scheidegg and then outsprinted him in the dash to the finish line. Sagan managed two other podium placings in the flat stages with an uphill sprint finish before winning stage 8 in another bunch sprint. This victory was enough to secure another points jersey for the young Slovak rider. He rode the Tour de Pologne as a preparation for the Vuelta. He took the leader's jersey after winning stage 4 and then he also won stage 5. Although he lost the jersey to Dan Martin after a difficult finish of stage 6, he managed to regain it on the final day of the race thanks to bonus seconds for intermediate sprint and a second place on the stage. He also claimed the points classification. Sagan targeted the Vuelta a España as his first Grand Tour appearance. He did not disappoint, earning 3 stage wins in the process. On stage 6, he caused a split in the small lead group by leading them down the final descent crouched on his bike to increase speed. Three teammates survived his onslaught, plus the heavily outnumbered Pablo Lastras Garcia (Movistar Team) and Sagan went on to win the sprint. He also won stage 12 in a sprint conclusion. His next objective was the final stage in Madrid, which he won thanks to a very narrow margin to rivals Daniele Bennati and Alessandro Petacchi. Sagan at the 2012 Tour of Flanders, where he finished in fifth place. He began the season in good form, winning a stage and the points classification in the Tour of Oman. Sagan won Stage 4 of Tirreno-Adriatico and also played a key role in helping Vincenzo Nibali win the event overall. Sagan's good form continued into the classics season, with fourth place in Milan-San Remo, second in Gent-Wevelgem, a stage victory in Three Days of De Panne, fifth in the Tour of Flanders and third in the Amstel Gold Race. On the first stage of the Tour of California, Sagan had a puncture with 7 kilometres to go. He worked his way back to the bunch and avoided a crash that occurred with 3 kilometres left in the race. His team-mate Daniel Oss piloted him in the last few kilometres, and Sagan out sprinted his rivals, taking the stage win. The very next day, he won again on stage 2, in Santa Cruz. After suffering a crash in the Empire Grade climb, he got back on and his team dragged him to the last corner of the race, a right bend with the finish line only a couple hundred metres away. Sagan was first out of the corner and accelerated to the finish, taking his second victory in a row. On the third stage, Sagan took his third consecutive victory by a very slim margin over Heinrich Haussler (Garmin–Barracuda) for the third time in a row. He would go on to win again on the fourth stage in a bunch finish. After the dust settled on the Tour, Sagan had five stage wins, including the eighth and final stage in Los Angeles and the points jersey, shattering the previous record of Tour of California stage wins with a cumulative of eight stages, the previous mark attained by Levi Leipheimer of the Omega Pharma–Quick-Step squad with six. He was also awarded for his performance with the sprinter's jersey. "I have never seen a rider like him. I do not think anyone has. He is the first-of-a-kind rider. You can expect everything because he can win what he wants. Anything. If he wins the Tour de France someday, it will not be a surprise to me. Watch out." Sagan demonstrated good form once again in the World Tour classified Tour de Suisse by winning four stages and the points classification jersey. He kicked things off with a somewhat surprising win in the opening prologue, besting local favorite and time trial specialist Fabian Cancellara (RadioShack–Nissan) by 4 seconds over the 7.3 km (4.5 mi) course. The second stage was not suited for him since it was a mountainous affair, but he did prevail on stage 3, in a thrilling finish where the bunch caught the final two escapees inside the final kilometer. The asphalt was wet with rain and Sagan's foot came out of his pedal in one of the last bend, but he managed to stay upright and pass Orica–GreenEDGE's Baden Cooke before the line, arms in the air and wearing the white jersey awarded to the best sprinter. The very next day, he took his third victory in four days, once again in rainy conditions. With about 350 metres to go, Marcus Burghardt of BMC Racing Team launched a sprint for the finish line. Sagan jumped out of his teammate's wheel to get into Burghardt's slipstream and sailed past him to take the win. He thanked his team for their efforts afterward, especially Moreno Moser, who "shut down every attack at the end of the race, letting me do the sprint I wanted; big thanks to Moreno and I hope I can return the favour soon." The next win came on stage 6, the last stage of the Tour which was suited to the sprinters. The final kilometres in Bischofszell were filled with urban obstacles such as roundabouts and sharp bends, and Sagan stayed with the head of the bunch. With 200 metres to go, Sagan took a left bend with a small patch of cobbles in it at full speed. He scraped the barriers as he came out of the corner with Orica–GreenEDGE's Michael Albasini on his left, and sprinted his way to victory. When asked about the seemingly close call he had in the aforementioned turn, the Slovak answered: "The finishes in the Tour de Suisse are never straight so you need to invent something to find some space [...]". Sagan at the 2012 Tour de France. Sagan won the points classification, winning three stages during the race. Sagan started the Tour by finishing in 53rd place on the Prologue after losing some time in the corners. He won the first stage in Seraing atop a small climb after breaking away with a little more than a kilometre to go with Fabian Cancellara (RadioShack–Nissan) and out sprinting him and Edvald Boasson Hagen (Team Sky). According to Sagan's SRM file, in the final 1.5 km when Cancellara initiated the move, Sagan ramped up his cadence to over 120rpm to stay with him and averaged 493 watts of power in the last 2 minutes 20 seconds of the race. His power output surged to 1,236 watts in the finale, averaging 970 watts in the last 200 metres. On Stage 3, he came atop the final Category 4 climb in Boulogne-sur-Mer sprinting away and leaving the field behind. As he crossed the finish line, which was situated at the end of the 700-metre slope, he made a gesture imitating the run of Forrest Gump. He won again on Stage 6, which had a course suited for a bunch sprint and finished in Metz. He beat pure sprinters Andre Greipel of Lotto–Belisol and Matthew Goss of the Orica–GreenEDGE squad by a little more than a bike length. He finished the Tour with 3 stage wins and the green jersey, also earning the "most combative" rider award on the mountainous Stage 14. He won a Porsche since he made a bet with the Liquigas management that he could win 2 stages and the points classification. He is a once-in-a-generation rider. He is super, super good. He is making us all look like juniors. In 2013, Sagan's team changed its name to Cannondale, since Liquigas ended its cycling sponsorship after eight years. Sagan started his season at the Tour de San Luis, coming close to success in the last stage by finishing second behind Mattia Gavazzi. He took his first victory of the season on the second stage of the Tour of Oman. Sagan broke away from a group of chasers in the final kilometres, joined three escapees but continued his effort to bank a solo win. He won again the very next day on a stage that featured the same course as stage 2 of the 2012 edition, which he had won as well. Before the start of stage 5, Sagan announced his withdrawal due to bronchitis. He scored a victory in his very first comeback race, the Gran Premio Città di Camaiore by out sprinting a group of twelve riders. He finished second at Strade Bianche, while his team-mate Moreno Moser won the event. Sagan covered the late break attempts to help Moser's bid for victory, then attacked himself to complete a one-two for Cannondale. He went on to win stages 3 and 6 of Tirreno–Adriatico. On stage 3, he out sprinted Mark Cavendish and André Greipel in pouring rain after his team accelerated the race's speed on a small climb nearing the finish. On stage 6, Sagan survived a climb featuring a section at a slated 30% incline, and formed a breakaway with former teammate Vincenzo Nibali and Joaquim Rodríguez. He beat both to the sprint. Sagan's excellent form meant he entered Milan–San Remo as the hot favourite for victory, however, he was beaten into second place in the sprint by MTN–Qhubeka's Gerald Ciolek. He won the Gent–Wevelgem race, which had been shortened by 90 kilometres (56 mi) due to extreme cold. Sagan broke away from a group of 10 riders with 4 kilometres (2.5 mi) remaining and won solo, performing a series of wheelies after crossing the line. Two days later, Sagan carried his good form to the Three Days of De Panne, where he won a close sprint ahead of Arnaud Démare of FDJ. Démare complained to the race officials that Sagan had swerved slightly in the final metres, but to no avail as they maintained Sagan's victory. Sagan finished second at the Tour of Flanders after breaking away with Fabian Cancellara and joining Jürgen Roelandts. Cancellara attacked on the last climb, the Paterberg, dropped Sagan and went on to win solo. Sagan caused some controversy on the podium by pinching the bottom of a podium girl, and after a media backlash, he apologized the next day. At the sign-up ceremony before the Brabantse Pijl, Sagan presented his apologies in person to the podium girl (Maja Leye) and gave her a flower bouquet. He then went on to win the race, where he chased an attack by Greg Van Avermaet in the final kilometers. Only Philippe Gilbert could follow, and Sagan was faster in the final dash for the line. His next win came in May on stage 3 of the Tour of California. In the somewhat hectic massive sprint, Sagan came from a long way to beat Michael Matthews, finding a passage on the right side of the road at the last moment. He concluded the Tour by winning the last stage in Santa Rosa, securing the points classification jersey for the fourth year in a row. On stage 3 of the Tour de Suisse, Sagan showed that he still has the ability to climb with the best in the sport. After making the selection on the category one climb, Sagan was able to distance himself along with Rui Costa, Roman Kreuziger and Mathias Frank on the final wet and narrow descent. The four held off the rest of the field and Sagan took the stage victory. Sagan cemented his victory in the points classification by taking the eighth stage, which was flatter and more suited to the sprinters. He got the best of Daniele Bennati and Philippe Gilbert. He then went on to win the Slovakian Road Race Championships for the third time, stating that he would be happy to harbor the national emblem on his jersey for the Tour de France. At the Tour, Sagan scored numerous second positions before winning stage 7 to Albi, after his team worked to shed the pure sprinters on the Category 2 Col de la Croix de Mounis. He outsprinted the select group he was part of, crossing the line before John Degenkolb. Sagan retained the green jersey to Paris and dyed his beard green to underline that victory. He then went on to win the sprints classification and numerous stages in the USA Pro Cycling Challenge (4 stage wins) and the Tour of Alberta (2 stage wins). Sagan got short of success in the Grand Prix Cycliste de Québec where he accelerated strongly on one of the final climbs but faded in sight of the finishing line. He compensated two days later by taking victory in the Grand Prix Cycliste de Montréal, escaping the leading group on a climb with five kilometers to go and winning solo. The successful year of 2013 was also acknowledged in Slovakia, where he became the Athlete of the Year, for the first time in his career. Sagan started the 2014 season at the Tour de San Luis, where he finished second on the final stage. Then he competed at Dubai Tour, where he took second and third place stage finishes; he lost out to Marcel Kittel on both occasions. He finished second at Strade Bianche again, this time he was defeated by Michał Kwiatkowski. The two riders attacked with 21 km (13.0 mi) to go, but Kwiatkowski was stronger on the final climb. At Tirreno–Adriatico Sagan won one stage and the points classification. Sagan finished tenth in Milan–San Remo, despite being considered one of pre-race favorites. Then he went on to win E3 Harelbeke and he finished 3rd in Gent–Wevelgem. Sagan's next attempt to win his first monument was at the Tour of Flanders, but he finished 16th. A week later Sagan competed at Paris–Roubaix, where he finished 6th. Sagan won the penultimate stage of the Tour of California, and also won the sprints classification, for the fifth successive year. In the first week of the Tour de France, Sagan scored seven top-5 finishes in a row, without registering a victory, a feat that had not been recorded since Charles Pélissier did eight top-5 finishes in a row in 1914. The seventh of those result came as a very close photofinish sprint between Sagan and Matteo Trentin, where Sagan had to settle for second by a few millimeters. In early August, Sagan and his older brother Juraj Sagan signed a three-year contract with Tinkoff–Saxo starting in 2015. The team's owner Oleg Tinkov confirmed Sagan's salary reached €4.5 million a year. Sagan went on to compete in the Clasica San Sebastian but withdrew. He then headed to the Vuelta a España and had a difficult first week, his first notable result coming as a third place on Stage 8. That was his only podium result and he withdrew on Stage 14. He made his return on 16 September at the Coppa Bernocchi, where he acted as a lead-out man for his victorious teammate Elia Viviani. In November, Sagan climbed Kilimanjaro with his new team Tinkoff-Saxo as a team-building experience. Sagan started his season at the Tour of Qatar, taking his first podium spot of the season on Stage 4 by finishing second. He finished second again the next day. He concluded the race first in the youth classification to win the white jersey. He subsequently headed to the Tour of Oman, failing to get his first season victory. He then participated to Tirreno–Adriatico, finishing second of the first and second stage. On Stage 6, Sagan took his first victory under the Tinkoff-Saxo colors in a flat stage which featured a lot of rain and breaks in the peloton. He finished the stage race in first in the points classification to earn the red jersey. He went on to compete in the Monument race Milan–San Remo, where he sprinted to a fourth position. In E3 Harelbeke, Sagan got clear of the main group with Geraint Thomas and Zdenek Stybar on the Oude Kwaremont with 41 kilometers left, but faded badly as Thomas attacked with 4 kilometers to go and finished 30th. Two days later, he finished tenth of Gent–Wevelgem, as only 39 riders finished the race. In April, he awarded himself the fourth place of the Tour of Flanders. He was chasing the leading duet with Greg Van Avermaet, but cracked in the finale, just like he did in the E3 Harelbeke. At Paris-Roubaix, he was in a group chasing the leaders, but had a mechanical problem with his shifter and had to change his bike in the final 10 kilometers, costing him precious time. He finished 23rd. After a break in competition, Sagan came back in May at the Tour of California. On the first stage, he finished second, in the slipstream of Mark Cavendish. He again came in second position on the next day to Cavendish, but this time he lost by half-a-wheel. On stage 3, Sagan once more reaped second position after a lone breaker, Toms Skujiņš, made it to the finish a minute before him. On Stage 4, Sagan won the day by powering away from Wouter Wippert and Cavendish on the small incline before the line. As he crossed the finish, Sagan banged his front wheel twice on the tarmac and treated the crowd to a no-footed wheelie afterward to celebrate. On the fifth stage, Sagan came in third position. However, in the ensuing Time Trial in Santa Clarita, Sagan imposed himself on the flat and slightly technical circuit, grabbing the general classification jersey in the process. On the following day's seventh stage climb up Mount Baldy, Sagan lost the overall lead to Julian Alaphilippe, however he put in a surprisingly strong performance to end the day two seconds behind Alaphilippe in the overall standings, and giving him a chance of taking the general classification through time bonuses on the final stage. He took a second out of Alaphilippe's lead in the intermediate sprint on the last stage to Pasadena, before pipping Tyler Farrar for third place on the finish line, taking a four-second bonus which gave him the overall win by three seconds. After some holidays, Sagan came back at the Tour de Suisse. He finished fourth in the prologue and tenth in the second stage after winning the sprint of the second group on the road. On the mountainous stage 3, he was helped greatly to victory by his teammate Rafal Majka who nullified a lot of attacks before Sagan outsprinted the reduced group to the finish line. He came in second on the fourth stage, missing the race lead by a single second. He won the sixth stage in a bunch sprint to tie the record of victories in the Tour de Suisse at eleven wins. The record holders are Hugo Koblet and Ferdi Kubler. Sagan got boxed in during the sprint on the following stage by a dubious move from José Joaquín Rojas Gil but managed a second position to Alexander Kristoff. He finished the Tour de Suisse with the Points jersey. He then won the Slovakian National Time Trial Championship on 26 June, followed by a solo win in the National Road Race Championships two days later. Both events were held in Sagan's hometown Žilina. In the Tour de France, after he suffered a flat tire and caught back up to the 25 rider lead group, Sagan took second position on Stage 2, where André Greipel beat him by a whisker. On the fourth Stage featuring cobbles, Sagan sprinted to a third position after protecting his leader Contador. On the fifth stage, he came in second again to Greipel after having made a late surge for the line. He had to settle for second again on the sixth stage, after Zdenek Stybar went solo on the last small climb before the finish. On the next stage he finished third to Cavendish and Greipel. He was second again on Stage 13, finishing in the wheel of Greg Van Avermaet. On the next stage, Sagan was part of the breakaway, amassing maximum points at the intermediate sprint and finishing fifth. On Stage 15, Sagan featured again in the breakaway and took fourth position in the final sprint. He had the 'most combative' award for his efforts. On the next stage, featuring the Category 2 Col de Manse near the finish line, Rubén Plaza (Movistar Team) escaped the leading group on the latter difficulty. Sagan chased him down the descent, but to no avail as Plaza soloed to victory. Sagan came in second and was awarded 'most combative' of the day again. Sagan amassed five second places in this Tour, and won the green jersey by a margin of 66 points over Greipel. Sagan broke his Grand Tour victory drought at the Vuelta a España by outsprinting Nacer Bouhanni and John Degenkolb on the third stage. On the next stage he finished second to Alejandro Valverde in a punchy finish. On Stage eight, a race organization motorcycle which was overtaking the peloton caused Sagan to crash. Although Sagan finished the stage, he was forced to retire of the Vuelta while leading the points classification. On September 27, Sagan won the World Road Race Championships in Richmond, Virginia. He attacked on 23rd Street, a short cobbled climb situated a little more than two kilometers from the finish to win solo. He finished the season at the Abu Dhabi Tour, where he recorded two second-place finishes. If I lose yellow, I have green. If I lose the green jersey, I have the rainbow jersey. Sagan started his season at the Tour de San Luis, taking his first podium place of the year on Stage 2 by finishing second. In February, after a three-week training camp in Spain's Sierra Nevada, he competed in the opening races of the Belgian classics season, finishing second in Omloop Het Nieuwsblad and seventh in Kuurne–Brussels–Kuurne. He then came in fourth at the Strade Bianche, being part of the four-man decisive move, but getting dropped on the final climb to Siena. He took part in Tirreno–Adriatico, where he finished second in the overall classification, a single second behind Greg van Avermaet. This edition of the race was different in character from other recent editions since the only mountainous stage had been cancelled due to snow. Sagan also won the points classification jersey. Sagan claimed his eighth second-place finish without a win since the World Championship at the Belgian road cycling classic E3 Harelbeke, before taking his first win as a world champion in Gent-Wevelgem, becoming the first reigning world champion to win the race since Rik Van Looy in 1962. Upon his win at Gent-Wevelgem Sagan became the World No.1 in the newly formed rankings. Sagan continued his successes by grabbing his first Monument victory at the Tour of Flanders, shedding his last opponent Sep Vanmarcke on the Paterberg and finishing the last 14 kilometers of the race solo, as the Cancellara-Vanmarcke duet had him in their sight but could not reach him. Sagan dedicated the win to two cyclists who died recently, Antoine Demoitié and Daan Myngheer. A week later, he took part in Paris-Roubaix, finishing eleventh after a split in the peloton occurred. He performed a stunt on a cobbled sector as Cancellara crashed directly before him by executing, a bunny hop over the Swiss' bike and avoided the crash, despite having only one foot clipped into his pedals at the time. In the Tour of California, Sagan won on stages one, which was a bunch sprint finish, and 4, where the finish was contested on the Mazda Raceway Laguna Seca. On stage 7, he was part of the breakaway, went solo from fifty kilometers to cover and was caught with 20 kilometers to go to the finish. He still managed a second place by a couple of inches over Alexander Kristoff. On stage 8 he took another 2nd place and clinched the points classification. On his next race, the Tour de Suisse, Sagan sprinted to victory on the hilly stage 1 around Baar. It was a record-breaking 12th victory for the Slovakian on the Swiss race. The very next day he won another stage after joining the late breakaway after attacking the reduced peloton at the end of a climb, and outsprinted the pair. In the Tour de France, Sagan came in third of the first stage. He then won the second stage which featured a finish on a category 3 climb to claim the yellow jersey for the first time in his career. He mentioned that he did not know he had won upon reaching the finish line, thinking more riders from the breakaway had crossed the line before him. Sagan was part of the breakaway on stage 10. He finished second to Michael Matthews and won the most combative award for his efforts. On the very next stage, Sagan broke away with yellow jersey wearer Chris Froome, Geraint Thomas and his teammate Maciej Bodnar in the final kilometers. He outsprinted Froome to foil the sprinters' plans. After the stage, asked why he undertook such a daring move, he said: "We are artists". Sagan claimed his 3rd victory by winning stage 16 in Bern, beating Alexander Kristoff in a sprint by few centimetres. He finished second to Greipel on the last stage in the Champs Élysées, securing his green jersey. He also was elected "most combative" rider of the whole Tour. His next race was the Mountain Bike race at the Olympics. He suffered a puncture on the second lap while he was in third position on the trail, and did not score a significant result as a consequence. After abandoning the GP de Plouay – Bretagne due to a virus, he went on to win the Grand Prix Cycliste de Québec and finished second in the Grand Prix Cycliste de Montréal. Throughout the 2016 Sagan's agent Lombardi negotiated a new contract with Bora-Argon 18. According to Oleg Tinkov, the owner of Tinkoff team, Sagan is expected to earn €6 million a year. Sagan will be joining Bora after it was announced that his current team Tinkoff will be disbanding at the end of the 2016 season. Sagan's new team will be called Bora-Hansgrohe for the 2017 season. On October 16, Sagan won the World Championship for a second time at the World Road Race Championships in Doha, Qatar. He came into the finish with the other 24 breakaway riders, and won the subsequent bunch sprint ahead of Great Britain's Mark Cavendish and Tom Boonen of Belgium, respectively. In December, he was awarded the prestigious Vélo d'Or award for the best rider of the year. Sagan married his girlfriend Katarína Smolková in Dolný Kubín in November 2015. They live in Monaco. ↑ Scott, George (3 July 2012). "Peter Sagan gets custom 'Tourminator' Cannondale SuperSix Evo for Tour de France". Road Cycling UK. Mpora. Retrieved 3 December 2016. ↑ "Video: Sagan on nicknames, victories and Tour de France green jersey". Cyclingnews.com. Immediate Media Company. 7 July 2013. Retrieved 3 December 2016. 1 2 "Peter Sagan profile". ↑ "Cannondale (CAN) – ITA". UCI World Tour. Union Cycliste Internationale. Retrieved 4 January 2013. ↑ Wilcockson, John (28 February 2011). "Inside Cycling with John Wilcockson: Man of the week Sagan — a Merckx in the making?". Velonews.com. Retrieved 19 June 2011. 1 2 "Sagan nabs record-breaking seventh career Amgen win in Clovis". VeloNews. 16 May 2012. Retrieved 17 May 2012. ↑ "World Championships: Peter Sagan claims second world title in 'lottery' sprint - Cyclingnews.com". ↑ "Bora-Hansgrohe announce Peter Sagan signing - Cyclingnews.com". ↑ Zánický, Peter (14 January 2008). "Bilancia Petra Sagana v sezóne 2007". Mtbiker.sk. Retrieved 18 May 2012. ↑ "Sagan, what a story...". uci.ch. 19 June 2008. Retrieved 19 June 2011. ↑ Abraham, Richard. "Peter Sagan: Rider Profile". Cycling Weekly. Retrieved 26 October 2013. ↑ "Peter Sagan – The world's #4 best pro rider". CyclingQuotes. November 19, 2013. Retrieved April 4, 2014. ↑ Brown, Gregor (4 February 2010). "LATEST FEATURES: LIVE FROM LAKE COMO: SAGAN LETS HIS LEGS DO THE TALKING". Retrieved 20 June 2011. ↑ Holcombe, Brian (15 June 2010). "BOY WONDER THE FUTURE IS NOW FOR PETER SAGAN". velonews-digital.com. Retrieved 19 June 2011. ↑ Benson, Daniel (12 March 2010). "Sagan wins his second stage with audacious attack". Retrieved 20 June 2011. ↑ Gruber, Jered (15 June 2010). "Peter Sagan out of the Tour de Suisse". Velonation.com. Retrieved 19 June 2011. ↑ Gruber, Jered (28 November 2010). "Peter Sagan's season start pushed back, still suffering from stomach problems". Velonation.com. Retrieved 19 June 2011. ↑ Richard Tyler. "Liquigas-Cannondale hit the Dolomites for training camp". Cyclingnews.com. ↑ Farrand, Stephen (26 February 2011). "Sagan secures Sardegna success". cyclingnews.com. Retrieved 26 October 2013. ↑ "Chris Horner wins 2011 Amgen Tour of California as Matt Goss takes stage 8". VeloNews.com. May 22, 2011. Retrieved April 4, 2014. 1 2 "Peter Sagan". Cycling Quotient. Retrieved 26 October 2013. ↑ "Tour de Pologne Peter Sagan's Accomplishment in Krakow". Tour de Pologne. 6 August 2011. Retrieved 26 October 2013. ↑ "Vuelta a España: Peter Sagan wins as Liquigas-Cannondale tears stage six apart". Velo Nation. 25 August 2011. Retrieved 13 October 2012. ↑ Ben Atkins (11 September 2011). "Vuelta a España: Peter Sagan's third stage win seals Juan José Cobo's victory". Velo Nation. Retrieved 13 October 2012. ↑ "Tour of California: Peter Sagan wins in Santa Rosa". Cycling News. 13 May 2012. Retrieved 14 May 2012. ↑ "Sagan wins stage 2 of the Amgen Tour". Velo News. 14 May 2012. Retrieved 14 May 2012. ↑ Weislo, Laura (15 May 2012). "Sagan three-peats in Livermore". Cycling News. Retrieved 16 May 2012. ↑ Atkins, Ben (16 May 2012). "Tour of California: Peter Sagan sprints again to go four from four". VeloNation. Retrieved 16 May 2012. ↑ Weislo, Laura (20 May 2012). "Gesink seals overall victory in Tour of California". Cycling News. Retrieved 29 May 2012. ↑ "Peter Sagan repeats performance and clinches Stage 4 victory". Tour of California. Anschutz Entertainment Group. 16 May 2012. Retrieved 17 May 2012. He [Sagan] now also holds the record for most stage wins – seven – in the history of the Amgen Tour of California. ↑ "Second Coming of the Cannibal?". Bicycling. 9 February 2013. Retrieved 9 February 2013. ↑ Atkins, Ben (9 June 2012). "Tour de Suisse: Peter Sagan descends fearlessly to take opening time trial". Velo Nation. Retrieved 9 August 2012. ↑ Atkins, Ben (11 June 2012). "Tour de Suisse: Peter Sagan wins stage three as Swiss Railways gives the breakaway a chance". Velo Nation. Retrieved 9 August 2012. ↑ Atkins, Ben (12 June 2012). "Tour de Suisse: Sagan unbeatable again in a rain sodden fourth stage". Velo Nation. Retrieved 9 August 2012. ↑ Westemeyer, Susan (14 June 2012). "Sagan wins stage 6 in Bischofszell". Cycling News. Retrieved 9 August 2012. ↑ Westemeyer, Susan (1 July 2012). "Sagan triumphs in Seraing". Cycling News. Retrieved 1 July 2012. ↑ "Sagan Soars to Victory in Stage 1". SRM. 1 July 2012. Retrieved 4 July 2012. ↑ "Sagan dances to second Tour de France stage win". Cycling News. 3 July 2012. Retrieved 3 July 2012. ↑ "Sagan nails second Tour victory". SuperSport. MultiChoice LTD. 3 July 2012. Retrieved 4 July 2012. ↑ Clarke, Les (6 July 2012). "Sagan wins Tour de France stage 6 in Metz". Cycling News. Retrieved 6 July 2012. ↑ "Sagan: I wanted a Tour stage win and I got three". Cycling News. 23 July 2012. Retrieved 26 July 2012. ↑ "Sagan set to win Porsche in Paris". Cycling News. 17 July 2012. Retrieved 26 July 2012. ↑ "Cavendish: Sagan's 'making us all look like juniors'". Velonews. 27 March 2013. Retrieved 15 December 2013. ↑ Gregor Brown (7 December 2012). "As Liquigas exits cycling, company claims brand recognition worth 'at least' five times its investment". VeloNews. Retrieved 13 February 2013. ↑ Atkins, Ben (27 January 2013). "Daniel Diaz confirms overall as Mattia Gavazzi marks return with stage seven victory". VeloNation. Retrieved 13 February 2013. ↑ Ben Atkins (12 February 2013). "Tour of Oman: Peter Sagan wins stage two in a late solo break". VeloNation. Retrieved 13 February 2013. ↑ "Tour of Oman: Peter Sagan Wins Again". Bicycling. AFP. 13 February 2013. Retrieved 15 February 2013. ↑ "Tour of Oman: Froome takes stage five". Cycling News. 15 February 2013. Retrieved 15 February 2013. ↑ Shane Stokes (28 February 2013). "Sagan over bronchitis, sprints to victory in G.P. Camaiore". VeloNation. Retrieved 28 February 2013. ↑ "Moreno Moser wins 2013 Strade Bianche on final climb". VeloNews. 2 March 2013. Retrieved 2 March 2013. ↑ "Sagan beats Cavendish in Tirreno-Adriatico sprint". Eurosport. 9 March 2013. Retrieved 11 March 2013. ↑ "Sagan wins, Nibali takes race lead in Tirreno-Adriatico breakaway". Cycling News. 11 March 2013. Retrieved 11 March 2013. ↑ Ryan, Barry (17 March 2013). "Sagan rues missed opportunity at Milan-San Remo". Cycling News. Retrieved 18 March 2013. ↑ "Peter Sagan wins Gent-Wevelgem one-day classic in style". BBC Sports. 24 March 2013. Retrieved 26 March 2013. ↑ "Sagan wins opening stage at Driedaagse De Panne". Cycling News. 26 March 2013. Retrieved 26 March 2013. ↑ "Cancellara Wins 2013 Tour of Flanders". Bicycling.com. AFP. 31 March 2013. Retrieved 1 April 2013. ↑ Emma Bamford (1 April 2013). "Slovakian cyclist Peter Sagan criticised for pinching the bottom of podium girl after Tour de Flanders". Belfasttelegraph.co.uk. Retrieved 1 April 2013. ↑ "Sagan apologizes for the pinch on Tour of Flanders podium". Cyclingnews. 1 April 2013. Retrieved 1 April 2013. ↑ "Sagan apologizes, gives flowers to podium girl after Flanders incident". VeloNews. 9 April 2013. Retrieved 10 April 2013. ↑ Ben Atkins (9 April 2013). "Peter Sagan outsprints Philippe Gilbert to take the Brabantse Pijl". VeloNation. Retrieved 10 April 2013. ↑ "Sagan wins stage 3 of 2013 Amgen Tour of California". VeloNews. 14 May 2013. Retrieved 15 May 2013. ↑ "Peter Sagan takes finale as Tejay van Garderen wins 2013 Amgen Tour of California". VeloNews. 19 May 2013. Retrieved 26 May 2013. ↑ "Sagan Wins Tour de Suisse Stage 3". Bicycling. 10 June 2013. Retrieved 17 June 2013. ↑ "Peter Sagan wins stage 8 of the 2013 Tour de Suisse". VeloNews. 15 June 2013. Retrieved 17 June 2013. ↑ "Tour de France's top sprinters in national colors". Cyclingnews.com. 23 June 2013. Retrieved 24 June 2013. ↑ Jerome Pugmire (5 July 2013). "Slovakian Peter Sagan wins Stage 7 of Tour de France". The Globe and Mail. The Associated Press. Retrieved 17 July 2013. ↑ John MacLeary (21 July 2013). "Tour de France 2013, stage 21: as it happened". The Telegraph. Retrieved 16 October 2013. ↑ Pat Hickey (15 September 2013). "Slovac Sagan wins Grand Prix Cycliste de Montréal". The Montreal Gazette. Retrieved 16 October 2013. ↑ Matt Shu (December 22, 2013). "Peter Sagan wins Slovakian athlete of the year awar". CyclingQuotes. Retrieved February 3, 2014. ↑ Hymas, Peter (27 January 2014). "Sagan eyes Milan-San Remo after San Luis outing". Cyclingnews.com. Retrieved 10 February 2014. ↑ Farrand, Stephen (6 February 2014). "Sagan satisfied with second in the Dubai Tour sprint". Cyclingnews.com. Retrieved 10 February 2014. ↑ Benson, Daniel (7 February 2014). "Marcel Kittel wins stage 3". Cyclingnews.com. Retrieved 10 February 2014. ↑ Farrand, Stephen (9 March 2014). "Sagan struggles to smile after second place in Strade Bianche". Cyclingnews.com. Retrieved 23 March 2014. ↑ Benson, Daniel (8 March 2014). "Kwiatkowski wins Strade Bianche". Cyclingnews.com. Retrieved 24 March 2014. ↑ "Sagan dedicates Tirreno stage win to ailing mother". VeloNews. March 14, 2014. Retrieved March 23, 2014. ↑ "Peter Sagan Won Points Classification in Tirreno-Adriatico 2014". Cycling News. Retrieved March 23, 2014. ↑ Farrand, Stephen (23 March 2014). "Sagan suffers in the cold and rain at Milan-San Remo". Cyclingnews.com. Retrieved 12 April 2014. ↑ "Sagan: I'll be satisfied if I win Milan-San Remo". Cyclingnews.com. 20 March 2014. Retrieved 12 April 2014. ↑ "Cancellara wins the 2014 Tour of Flanders". Cyclingnews.com. 6 April 2014. Retrieved 12 April 2014. ↑ Ryan, Barry. "Sagan happy to give a demonstration at Paris-Roubaix". Future plc. Retrieved 27 April 2014. ↑ "Peter Sagan wins stage 7 of the Amgen Tour of California". VeloNews. 17 May 2014. Retrieved 18 May 2014. ↑ "our de France 2014 – Même sans gagner, Sagan marque l'histoire". SportsSpirit (in French). WordPress. 11 July 2014. Retrieved 24 July 2014. ↑ "Trentin wins stage 7 of the Tour de France". Cyclingnews.com. 11 July 2014. Retrieved 24 July 2014. ↑ "Tinkoff-Saxo signs Peter Sagan". Team Tinkoff-Saxo. August 8, 2014. Retrieved August 8, 2014. 1 2 "Sagan podpísal s Borou, stane sa najlepšie plateným cyklistom sveta". MAFRA Slovakia. July 20, 2016. Retrieved July 20, 2016. ↑ "34th Clasica Ciclista San Sebastian". Procyclingstats. 2 August 2014. Retrieved 31 August 2014. ↑ "Results: 2014 Vuelta a España, stage 8". VeloNews. 30 August 2014. Retrieved 31 August 2014. ↑ Joe Sharratt (6 September 2014). "Cannondale's Peter Sagan withdraws from Vuelta a España". Sports Mole. Retrieved 6 September 2014. ↑ "Viviani wins unusually hard Coppa Bernocchi". CyclingQuotes. CyclingQuotes.com 2013. 16 September 2014. Retrieved 16 September 2014. ↑ Nigel Wynn (12 November 2014). "Film released of Alberto Contador, Peter Sagan and Tinkoff-Saxo team climbing Kilimanjaro". Cycling Weekly. Retrieved 22 November 2014. ↑ "Kristoff grabs another Qatar stage win, Terpstra stays in front". VeloNews. 11 February 2015. Retrieved 11 February 2015. ↑ Stuart Clarke (12 March 2015). "Debusschere wins Tirreno-Adriatico stage two as Cavendish caught up in crash". Cycling Weekly. Retrieved 12 March 2015. ↑ "Tirreno-Adriatico: Van Avermaet wins stage 3". Cyclingnews.com. 13 March 2015. Retrieved 13 March 2015. ↑ Nigel Wynn (16 March 2015). "Peter Sagan takes first victory of season in Tirreno-Adriatico". Cycling Weekly. Retrieved 16 March 2015. ↑ "Results: 2015 Milano-Sanremo". VeloNews. 22 March 2015. Retrieved 22 March 2015. ↑ "Thomas solos away from Stybar to win E3 Harelbeke". Cyclingnews.com. 27 March 2015. Retrieved 27 March 2015. ↑ Nigel Wynn (29 March 2015). "Luca Paolini wins memorable edition of Ghent-Wevelgem". Cycling Weekly. Retrieved 29 March 2015. ↑ Barry Ryan (5 April 2015). "Sagan falls short again in Tour of Flanders finale". Cyclingnews.com. Retrieved 5 April 2015. ↑ Sadhbh O'Shea (12 April 2015). "Broken shifter spoils Sagan's chances at Paris-Roubaix". Cyclingnews.com. Retrieved 13 April 2015. ↑ Emil Axelgaard (10 May 2015). "Cavendish crushes the opposition in California opener". Cycling Quotes. CyclingQuotes.com 2013. Retrieved 11 May 2015. ↑ Emil Axelgaard (11 May 2015). "Cavendish beats Sagan in close sprint in California". Cycling Quotes. CyclingQuotes.com 2013. Retrieved 11 May 2015. ↑ Nigel Wynn (12 May 2015). "Mark Cavendish loses Tour of California overall lead to surprise stage winner". Cycling Weekly. Retrieved 12 May 2015. ↑ "Tour of California: Sagan finally gets his win in Avila Beach". Cyclingnews.com. 13 May 2015. Retrieved 13 May 2015. ↑ Spencer Powlison (15 May 2015). "Sagan wears Amgen Tour of California yellow after winning TT". VeloNews. Retrieved 15 May 2015. ↑ "Tour of California: Alaphilippe wins on Mt. Baldy". cyclingnews.com. 18 May 2015. Retrieved 19 May 2015. ↑ "Sagan wins Tour of California on time bonus". cyclingnews.com. 18 May 2015. Retrieved 19 May 2015. ↑ Stuart Clarke (15 June 2015). "Peter Sagan wins stage three of the Tour de Suisse; Thomas fourth overall". Cycling Weekly. Retrieved 15 June 2015. ↑ "Tour de Suisse: Matthews wins stage 4". Cyclingnews.com. 16 June 2015. Retrieved 16 June 2015. ↑ "Tour de Suisse: Sagan wins stage 6". Cyclingnews.com. 18 June 2015. Retrieved 18 June 2015. ↑ "Kristoff claims Tour de Suisse stage 7 in long-range sprint". VeloNews. 19 June 2015. Retrieved 19 June 2015. ↑ Axelgaard, Emil (26 June 2015). "Sagan crushes the opposition at Slovakian TT championships". Cycling Quotes. CyclingQuotes.com 2013. Retrieved 26 June 2015. ↑ Monks, Kev (29 June 2015). "Nibali, Valverde And Sagan Amongst The National Champions". sport.co.uk. 2012–2015 Sport.co.uk. Retrieved 30 June 2015. ↑ "Tour de France: Greipel wins storm-swept stage to Neeltje Jans". Cyclingnews.com. 5 July 2015. Retrieved 5 July 2015. ↑ MacMichael, Simon (7 July 2015). "Tour de France Stage 4: Tony Martin attacks to finally get into yellow". RoadCC. Farrelly Atkinson. Retrieved 7 July 2015. ↑ MacMichael, Simon (8 July 2015). "Tour de France Stage 5: André Greipel takes second win, Mark Cavendish third". RoadCC. Farrelly Atkinson Ltd. Retrieved 8 July 2015. ↑ "Tour de France: Stybar wins stage 6 on short, punchy hill in Le Havre". Cyclingnews.com. 9 July 2015. Retrieved 9 July 2015. ↑ "Tour de France: Cavendish gets his first in Fougères". Cyclingnews.com. 10 July 2015. Retrieved 10 July 2015. ↑ "Tour de France: Van Avermaet wins uphill sprint in Rodez". Cyclingnews.com. 17 July 2015. Retrieved 17 July 2015. ↑ "Tour de France: Cummings soars to victory in Mende". Cyclingnews.com. 18 July 2015. Retrieved 18 July 2015. ↑ Windsor, Richard (19 July 2015). "André Greipel makes it three as he wins Tour de France stage 15". Cycling Weekly. Retrieved 19 July 2015. ↑ "Tour de France stage 16: Plaza gives Lampre-Mérida a win in Gap". Cyclingnews.com. 20 July 2015. Retrieved 20 July 2015. ↑ "Chris Froome wins Tour de France 2015". Cyclingnews.com. 26 July 2015. Retrieved 27 July 2015. ↑ "Vuelta a España: Peter Sagan wins stage 3". Cyclingnews.com. 24 August 2015. Retrieved 24 August 2015. ↑ "Vuelta a España: Valverde wins stage 4". Cyclingnews.com. 25 August 2015. Retrieved 25 August 2015. ↑ Elton-Walters, Jack (29 August 2015). "Five talking points from stage eight of the Vuelta a España". Cycling Weekly. Retrieved 29 August 2015. ↑ "Peter Sagan calls it a Vuelta after incident with moto". VeloNews. 30 August 2014. Retrieved 1 September 2015. ↑ "Peter Sagan goes solo to win men's road race at world championships". The Guardian. Press Association. 27 September 2015. Retrieved 27 September 2015. ↑ "Chaves wins inaugural Abu Dhabi Tour". Cyclingnews.com. 11 October 2015. Retrieved 11 October 2015. ↑ "Sagan celebrates taking Tour de France yellow but is critical of dangerous riding". Immediate Media Company Limited. July 3, 2016. Retrieved July 3, 2016. ↑ Wynn, Nigel (19 January 2016). "Tour de San Luis: Fernando Gaviria wins stage two". Cycling Weekly. Time Inc. UK. Retrieved 19 January 2016. 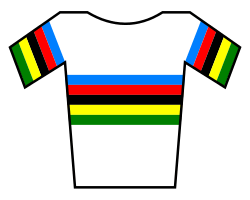 ↑ "Sagan debuts rainbow jersey in Europe at Omloop". VeloNews.com. Retrieved 28 February 2016. ↑ "Cancellara nabs third career Strade Bianche victory". VeloNews. Competitor Group, Inc. 5 March 2016. Retrieved 5 March 2016. ↑ "Tirreno-Adriatico: Van Avermaet claims overall victory". Cyclingnews.com. Immediate Media Company. 15 March 2016. Retrieved 15 March 2016. ↑ "Antoine Demoitie: Belgian rider dies after Gent-Wevelgem accident". 28 March 2016 – via www.bbc.com. ↑ Brown, Gregor (27 March 2016). "Peter Sagan: 'There's more to life than winning or second places'". Cycling Weekly. Retrieved 27 March 2016. ↑ "Sagan tops UCI WorldTour and World Rankings". Cycling News. Retrieved 2 August 2016. ↑ Brown, Gregor (3 April 2016). "Peter Sagan dedicates Flanders win to Antoine Demoitié and Daan Myngheer". Cycling Weekly. Time Inc. UK. Retrieved 3 April 2016. ↑ "Tour of California: Kristoff wins in Santa Rosa". Cyclingnews.com. Immediate Media Company. 19 May 2016. Retrieved 19 May 2016. ↑ "11th Amgen Tour of California (2.HC) Stage 8 » Sacramento › Sacramento". ProCyclingStats. Retrieved 26 May 2016. ↑ Puddicombe, Stephen (12 June 2016). "Peter Sagan wins record-breaking 12th Tour de Suisse stage". Cycling Weekly. Time Inc. UK. Retrieved 12 June 2016. ↑ "Tour de Suisse: Sagan wins stage 3". Cyclingnews.com. Immediate Media Company. 13 June 2016. Retrieved 13 June 2016. ↑ "Tour de France: Sagan wins stage 2". Cyclingnews.com. Immediate Media Company. 3 July 2016. Retrieved 3 July 2016. ↑ Brown, Gregor (12 July 2016). "Peter Sagan: 'What can I say? It didn't go very well'". Cycling Weekly. Time Inc. UK. Retrieved 12 July 2016. ↑ Hood, Andrew (13 July 2013). "Sagan on attack with Froome: "We are artists"". VeloNews. Competitor Group, Inc. Retrieved 13 July 2013. ↑ Mortkowitz, Siegfried (25 July 2016). "The Heroes of the 2016 Tour de France". WeloveCycling. Retrieved 21 September 2016. ↑ Benjamin, Haworth (21 August 2016). "Peter Sagan suffers disastrous day in Olympic MTB after bright start". Cycling Weekly. Time Inc. UK. Retrieved 22 August 2016. ↑ Wynn, Nigel (28 August 2016). "Peter Sagan abandons first road race after Olympics with illness". Cycling Weekly. Time Inc. UK. Retrieved 21 September 2016. ↑ Hickey, Pat (9 September 2016). "Peter Sagan beats Olympic champion at Grand Prix Cycliste in Quebec City". Montreal Gazette. Postmedia Network. Retrieved 21 September 2016. ↑ Ryan, Barry (16 October 2016). "World Championships: Peter Sagan claims second world title in 'lottery' sprint". Cyclingnews.com. Immediate Media Company. Retrieved 3 December 2016. ↑ "Sagan awarded Velo d'Or". Cyclingnews.com. Immediate Media Company. 1 December 2016. Retrieved 3 December 2016. Wikimedia Commons has media related to Peter Sagan.